I watched Lost avidly on Channel 4, and then begrudingly on Sky when they poached it, but the loss of the channel on Virgin Media led to a rather surprisingly easy loss of interest. As most people may know, the series is mostly shot in Hawaii, so certain liberties have to be taken when shooting scenes supposedly set in other parts of the world. Presumably the production team are more aware of how convincingly they should do this for supposed locations in the United States, although one does wonder given their attempts to portray some places further afield. In the Season 2 episode Fire + Water (25/01/06), a flashback shows Charlie Pace (Dominic Monaghan) living in London, having an argument with his brother, Liam (Neil Hopkins). The latter storms out into an adjoining alleyway, and heads towards Brixton station. 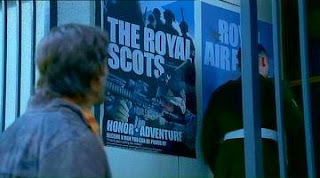 Despite the presence of a piece of Union Flag grafitti and a red telephone box, this setting is less than convincing, and you would have thought that Monghan would have told the producers that in Britain homeless guys don't tend to stand around warming themselves on fires in oil drums! 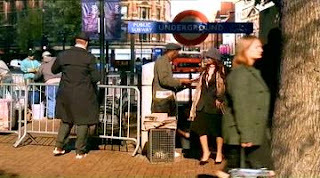 The "station," naturally enough, was just a small shop-front dressed with a roundel and sign. A bit more effort was taken with the Season 3 episode Flashes Before Your Eyes (14/02/07) which featured Desmond Hume (Henry Ian Cusick) in a central London street. 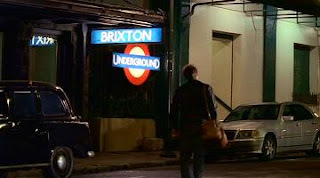 This was shot in a street in Hawaii, complete with fake London Underground subway entrances, similar to those seen at Piccadilly Circus or Chancery Lane. 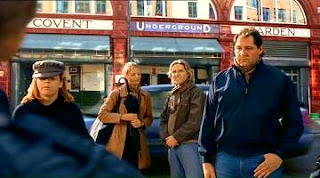 Finally, later in Season 3, Greatest Hits (16/05/07) has Charlie busking across the road from Covent Garden station. At first glance it does seem like they actually shot it at the real location, but the giveaway is that the road is far wider than in real life, and in actual fact it is a photograph of the real station CGIed into the background.